Sailing, Who Has The Right Of Way? Sailing isn’t as popular in Utah as it is in other places in the country and while sailing at the lake is fantastic, we often come across power boats that don’t understand the rules. Who Has the right of way? That’s one of the biggest challenges we face every time we go sailing. This is also an issue during a race, or whenever there are more than two sailboats in the same vicinity at once. Let’s clear this up once and for all, Here are a few rules you can remember without having a cheat sheet about Who Has The Right Of Way. Remember that a sailboat running an engine, even if sails are up, is legally categorized as a powerboat. In most cases, the sailboat will stand on (or have ROW) and the powerboat should give way. Generally speaking a sailboat has less maneuverability under sail than a powerboat, therefore, the boat with less maneuverability will stand on. The only exceptions in this case are if the sailboat is overtaking the powerboat, or if a large ship is coming, the sailboat will give way to it. Just a little common sense right? 1. A sailboat running free must keep clear of one close hauled. The arrow indicates the direction of the wind. The black boat is “privileged”, and has the right-of-way. The blue boat is the “burdened” boat and must get out of the way. 2. A sailboat close hauled on the port tack must keep clear of a sailboat close hauled on the starboard tack. Watch the video below, courtesy of NauticEd. 3. When both boats are running free on opposite tacks the vessel with the wind on the port side must keep clear. 4. 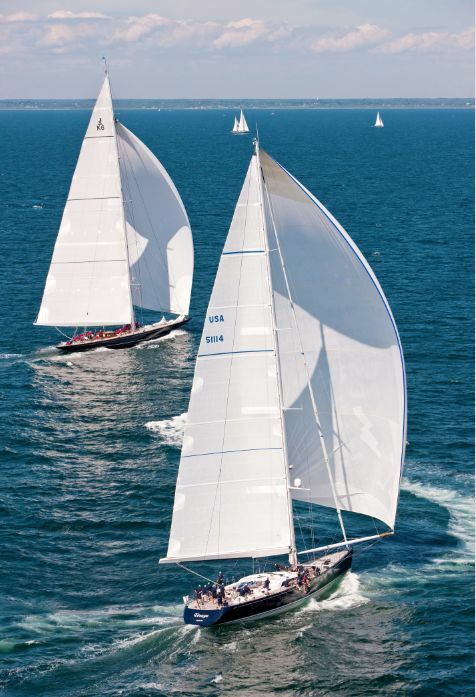 When both boats are running free on the same tack the boat to windward must keep clear. Now you know when a sailboat has the Right of Way and when it doesn’t. Generally speaking, a sailboat with a starboard tack (sails to the left, wind comes across the boat from the starboard side) has the right of way. So get out on the water and R-E-S-P-E-C-T the rules and each other. Happy Sailing Season 2014!